Do you need inspiration and ideas for recipes that you can meal prep? 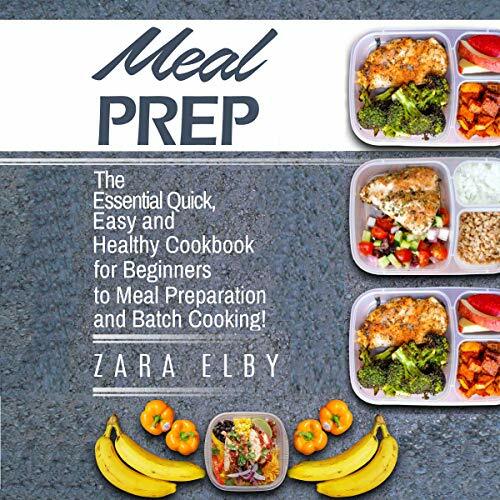 If so, Meal Prep: The Essential Quick, Easy and Healthy Cookbook for Beginners to Meal Preparation and Batch Cooking! by Zara Elby is the audiobook for you! While it is common knowledge that meal preparation is the go-to for saving you time and improving your health by giving you nutritious recipes available when you need them, getting the vitamins and nutrients you need throughout the day has never been more simple and stress-free. This guide aims to provide you with filling, tasty, and healthy recipes that will satisfy your cravings and suppress your hunger. Why choose this audiobook? This audiobook includes our tried-and-tested recipes for all times of the day, teaching you the best recipes to save you time throughout the week, as well as providing you nutritious and filling recipes that you will want to eat everyday! Our audiobook also includes the nutritional information, so whether you are counting calories or tracking your carb or fat intake, this is the audiobook for you. What are you waiting for? Kick-start your life now by downloading this audiobook!